The moment Eliot Wadopian first saw a double bass, he was transfixed. “It’s a wonderful memory,” he recalled. “I was six years old. I was sitting next to my dad at the Thomas Wolfe Auditorium. The orchestra came out on stage — and I saw someone, a bass player, dragging out this big thing that I had never seen before. “And that’s what I’m doing,” he said. For 38 years, Wadopian has performed with the Asheville Symphony. 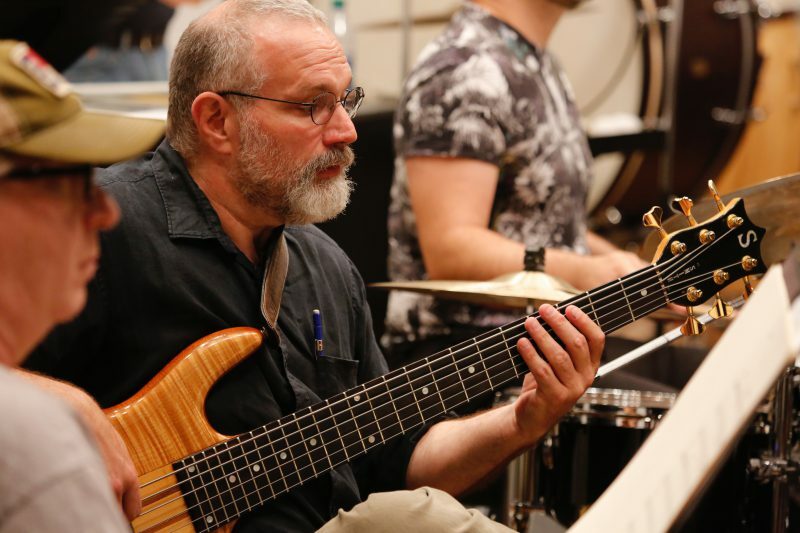 He started on bass guitar at age 13 or 14 — and picked up the string bass, that odd instrument from his childhood memory, shortly after. Through his music, Wadopian has been to Russia. He’s traveled across Asia. He’s been to the Philippines, Greenland, Israel. He once spent 30 days touring China. Not only did he perform for people of other cultures, but he spent his time abroad listening, soaking up different sounds across the globe. In the Philippines, Wadopian once heard the din of distinctly American music flowing through the streets. Drawn to the sounds of his own culture, he followed the music — and found a band of Filipino musicians rocking out to a full crowd. No matter the culture, background or physical position across the globe, “music is such a powerful way of bringing folks together,” Wadopian continued. As he traveled from place to place, he began collecting different sounds, adding pieces of other cultures to tracks in his head. After each tour, Wadopian returned to Asheville, where he watched the city — and the symphony — grow and evolve with every passing year. In addition to his work with the Symphony, Wadopian makes up one-third of the band Free Planet Radio, combining the global sounds from his travels on upright bass, drum and host of other instruments — Indian dotar, sarod, Turkish cumbus oud, melodica, piano. “It’s a little bit like working on two different sides of the musical brain,” he said. In Free Planet Radio, he can flex his creative muscle, hatching intricate ideas to blend mountain melodies with the traditional music of North Africa, India, the Middle East. 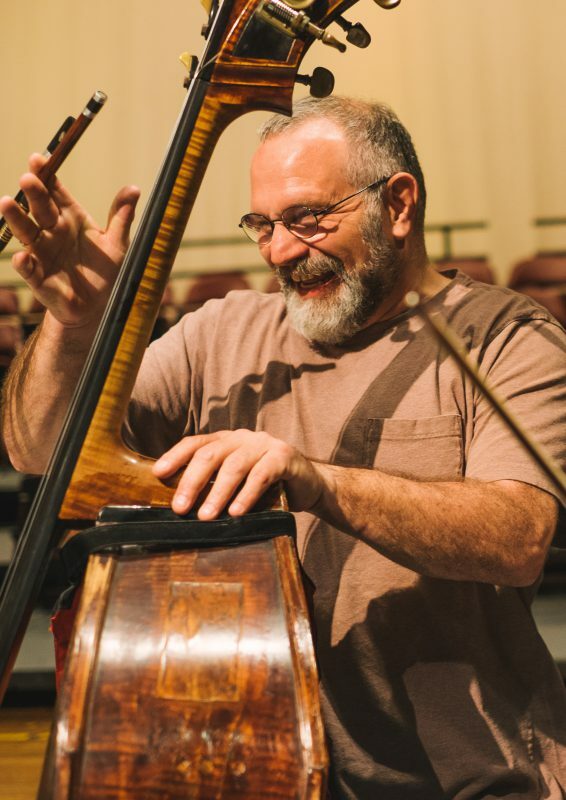 But with the Symphony, he contributes to the Asheville community in a completely different way, working as a team with other musicians — other bassists — to perfect complex and challenging arrangements that have often awed audiences for centuries. On one of the city’s largest stages, Wadopian and five other bassists form a foundation on which other instruments build. Over his decades with the Asheville orchestra, he’s watched the Symphony become more and more involved in the community — and vice versa. But, most of all, Wadopian is just happy to do what he loves best — on the instrument he first heard on the stage where he now performs.